"No one can slave for two masters; for either he will hate the one and love the other, or he will stick to the one and despise the other...."
Jane Mayer in Dark Money: The Hidden History of the Billionaires Behind the Rise of the Radical Right (2016) writes about the nebulous relationship between Donald Trump and Charles Koch due to a faux pas. Mayer writes that Charles Koch's force of his will, combined with his fortune, has made him one of the most formidable figures in modern American politics. Few had waged a more relentless or more effective assault on Americans' belief in government. He and his brother David had built and financed a private political machine that had helped cripple a twice-elected Democratic president [Barack Obama] and begun to supplant the Republican Party [with the Tea Party]. Education institutions and think tanks all over the country promoted his worldview, doubling as a talent pipeline. A growing fleet of nonprofits groups mobilized public opinion behind his agenda. The groups trained candidates and provided the technological and financial assistance necessary to run state-of-the-art campaigns. The money they could put behind their chosen candidates was seemingly limitless. Congressmen, senators, and presidential hopefuls now flocked to their secret seminars like supplicants, eager to please them in hopes of earning their support. Rare was the Republican candidate who wouldn't toe the Kochs' line. John Kasich, the iconoclastic governor of Ohio, prompted an angry walkout by some twenty donors at the Koch's April 2014 summit for criticizing the Koch network's position against Medicaid expansion. In answer to Randy Kendrick, who had questioned his pro-Medicaid position, Kasich retorted, "I don't know about you, lady. But when I get to the pearly gates, I'm going to have an answer for what I've done for the poor." He added, "He added, "I know this is going to upset a lot of you guys, but we have to use government to reach out to people living in the shadows." The Kochs never invited Kasich back again. Donald Trump, the New York real estate and casino magnate whose unorthodox bid for the Republican nomination flummoxed party regulars, was also left off the Kochs' invitation list. In August 2015, as his rivals flocked to meet the Koch donors, he tweeted, "I wish good luck to all the republican candidates that traveled to California to beg for money etc. from the Koch Brothers. Puppets?" Trump's popularity suggested that voters were hungry for independent candidates who wouldn't spout the donors' lines. His call to close the carried-interest tax loophole, and talk of the ultra-rich not paying its share, as well as his anti-immigrant rants, made his opponents appear robotically subservient, and out of touch. But few other Republican candidates could afford to ignore the Kochs. Among their most astonishing feats, the Kochs had succeeded in persuading hundreds of the other richest conservatives in the country to give them control over their millions of dollars in contributions, in effect making them leaders of a conservative billionaires' caucus. As a result of the insult done to the Koch network (the Kochtopus) Trump was force to fund funding elsewhere: American Zionist Sheldon Adelson. However as 2020 rolls around, Trump need a new source of financing and upon taking office in 2017 he filled his Kitchen Cabinet with what John Nichols calls "the most dangerous people in America." John Nichols in Horsemen of the Trumpocalypse: A Field Guide to The Most Dangerous People In America (2017) list Trump's hires--most of which are/were Kochtopus members. Mike Pompeo, now Secretary of State, "since his election," has been referred to as the "Koch Brothers' Congressman" and "the congressman from Koch." He is not the only Koch tied politician in the trump administration. UN ambassador Nikki Haley is another. Mick Mulvaney is another. Scott Pruitt is another. But it is fair to say that Pompeo is the most Koched up of the bunch, and that's a big deal, as the experience of bending to the Koch brothers does not prepare politicians to serve honorably in positions of public trust. President Trump tweeted Wednesday that CIA Director Mike Pompeo met with North Korean leader Kim Jong Un. David Greene talks to Shane Harris of The Washington Post, which first reported the story. This morning, in a tweet, President Trump confirmed that his CIA director, Mike Pompeo, recently met with North Korea's leader Kim Jong Un. Trump tweeted that, quote, "meeting went very smoothly, and a good relationship was formed." Now, the statement came hours after The Washington Post first reported this meeting. And I'm joined in the studio by the Post's intelligence and national security reporter, Shane Harris. Shane, good morning. GREENE: So you and your colleagues reported that Pompeo met with Kim over the Easter weekend. I mean, I guess over the Easter vacation. He's in North Korea for the vacation. What exactly do we know about this meeting? HARRIS: Well, we know that at this meeting, which was preceded by some pretty high-level communications between the CIA and its counterpart in North Korea already - this, of course, being sort of long distance - Pompeo makes the trip. He goes there. He meets with Kim Jong Un in person over the Easter weekend and secures some concessions or some terms, really, from North Korea about what it's willing to negotiate over when President Trump and Kim Jong Un ultimately meet, possibly sometime in the next month or so. And importantly, it's at this meeting we understand that the Americans get assurances from the North Koreans that they're willing to put this all-important issue of denuclearization on the table. So they're kind of setting the stakes or the terms of the negotiation before the two leaders actually meet face-to-face. GREENE: OK. So on the table, that doesn't necessarily mean that the regime in Pyongyang is ready to denuclearize. But based on your report, do you think the White House just wanted to know that President Trump wasn't going to get there and Kim wasn't just going to say, like, I'm not going to talk about this, go home? HARRIS: Exactly. This is the thing that really - that President Trump wants. He tweeted about it actually this morning, saying denuclearization will be a great thing for the world and North Korea. I don't think the White House wanted to come to the table and find out that they weren't even really to begin negotiating. They at least wanted to know that this was something that they could have a debate over. And it was interesting, in the days after Pompeo returned from North Korea, administration officials started saying on background, well, we now have very strong assurances from the North Koreans that this issue is up for negotiation. They wouldn't have said that had they not had really strong assurances, which was kind of a clue to us at the time too that something extraordinary had happened here, that they had gotten some pretty high-level concessions. And as it turns out, we think that they got them directly when Pompeo was in North Korea. And that gave the White House the confidence to think that they could say, yes, this is now on the table. GREENE: This is normal for a White House to have emissaries who are doing some sort of work ahead of time before a big summit. Some things not necessarily normal here. This is, I mean, this is North Korea, after all, and sending a top American official there is significant. And also, I mean, Pompeo was not the nation's top diplomat. Rex Tillerson - I mean, secretary of state is - I mean, Pompeo is going through confirmation hearings to become secretary of state. But that's odd to have someone speaking as the nation's top diplomat when that's not his job. HARRIS: Yeah, it is very unusual. And in this period, you know, it's a sort of awkward time because Rex Tillerson is at this point heading for the exits. President Trump had dismissed him via a tweet about two weeks earlier. But he was still, I mean, he literally - his official last day in the State Department is the day that Mike Pompeo, we think, is going to North Korea for that weekend. But even before that, I mean, you know, you raised this excellent point that the foreign policy towards North Korea and this administration has not been handled so much by the State Department. It is coming out of the CIA. Mike Pompeo was already having direct communications remotely with his counterparts in the North Korean intelligence agency. So for all intents and purposes, Mike Pompeo has been acting like the secretary of state when it comes to North Korea. GREENE: Well, let - I want to play a little bit of tape here because the issue of face-to-face talks between President Trump and Kim came up during Pompeo's confirmation hearing last week. MIKE POMPEO: I'm optimistic that the United States government can set the conditions for that appropriately so that the president and the North Korean leader can have that conversation, will set us down the course of achieving a diplomatic outcome that America so desperately - America and the world so desperately needs. GREENE: So Pompeo is already facing some skepticism, may not even be recommended by the Foreign Relations Committee. I mean, if he's there talking about these things in general but it hasn't been disclosed that he made a trip there, could that raise even more concerns among members of Congress? HARRIS: I think it could. I mean, members of a committee that's evaluating a nomination don't like to be caught flat-footed by this. And this is not just an ordinary mission that he was sent on. And as we've discussed, he wasn't the secretary of state yet. So I think there's going to be some real questions about why weren't they informed about this or who in Congress precisely did know, and what were they told? But now this does perhaps create an opening for Mike Pompeo to say to his critics, look, I'm not some, you know, hawk that you're making me out to be, at least not always. Here I am trying to have a conversation with North Korea on this hugely important issue. GREENE: Shane Harris of The Washington Post joining us in the studio this morning. Shane, thanks a lot. WASHINGTON — The Environmental Protection Agency violated the law when it installed a soundproof phone booth for the administrator, Scott Pruitt, at a cost of roughly $43,000, a congressional watchdog agency ruled on Monday. The congressional agency, the Government Accountability Office, said in a report that the E.P.A. had not notified Congress as required before spending more than $5,000 on office equipment. In a separate report Monday, the E.P.A.’s inspector general published records showing that Mr. Pruitt’s chief of staff signed off on hires and thousands of dollars in raises for political appointees under a provision of a clean water law. That report was part of an ongoing audit of salaries and hiring practices at the agency. The E.P.A. said the secure phone booth was necessary “to make and receive phone calls and to discuss sensitive information, including classified telephone calls up to the top secret level.” The agency paid about $24,000 for the phone booth and more than $20,000 to install a drop ceiling, remove closed-circuit television equipment and pour concrete around the booth, according to agency contracts. The G.A.O. said it was not taking a position on whether or not the installation of the privacy booth was necessary, but was focusing only on the violations of two laws: the Antideficiency Act, which is designed to prevent spending that has not been budgeted, and the Financial Services and General Government Appropriations Act, which limits the amount political appointees may spend on office item to $5,000. Auditors wrote that the E.P.A.’s “failure to comply with a governmentwide statutory requirement that an agency notify the appropriations committees before it spends more than $5,000 for the office of a presidential appointee” was a violation of the law and should be reported to Congress and the president. In an eight-page letter to lawmakers, Thomas H. Armstrong, the G.A.O.’s general counsel, said the agency did not send advance notice to Congress when it paid $43,238.68 from its Environmental Programs and Management budget to pay for the installation of the soundproof booth. The G.A.O. reports its findings to Congress but has little enforcement power of its own. Senator John Barrasso, Republican of Wyoming and chairman of the Environment and Public Works Committee, which has jurisdiction over the E.P.A., also criticized the agency, while not identifying Mr. Pruitt by name. The G.A.O. report noted that federal laws would not have blocked E.P.A. from purchasing the phone booth, and Ms. Bowman said that the accountability office had recognized the need for employees to have access to secure telephone lines to handle sensitive information. The other report Monday, from the E.P.A.’s own inspector general, an independent office within agency, did not draw any conclusions as to whether Mr. Pruitt or his chief of staff, Ryan Jackson, violated laws in using the Safe Drinking Water Act of 1974 to hire officials and award raises. Rather, it provided more than 80 pages of “requests for personnel action” showing that Mr. Jackson, often with the signed authorization of Mr. Pruitt, handled most of the paperwork associated with the employees. A spokesman for the E.P.A., Jahan Wilcox, said in a statement that Mr. Pruitt did not determine his appointee’s salaries or raises. That, he said, is done by the E.P.A. chief of staff, White House liaison, and career human resource officials. He said that the agency would continue to provide information to the inspector general for any further inquiries. The use of the Safe Drinking Water Act of 1974 to hire political appointees and grant raises to two Oklahoma aides has, in particular, drawn the ire of Democrats. According to documents provided under the Freedom of Information Act to American Oversight, a liberal watchdog group, Mr. Pruitt used the law to bring on board at least 20 political appointees, known as “administratively determined” hires. 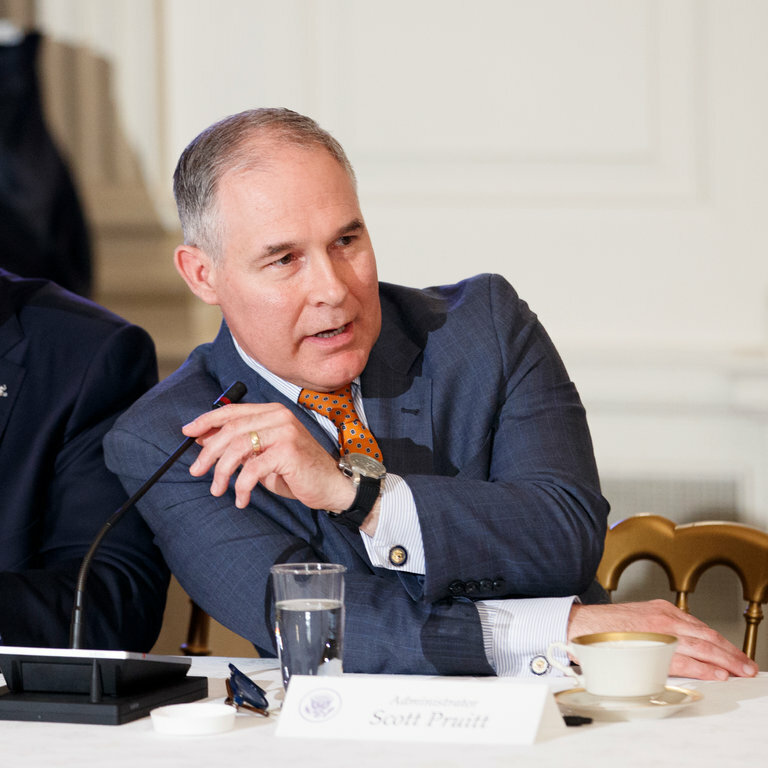 Among those hires were Sarah Greenwalt, who served as general counsel for Mr. Pruitt when he served as attorney general of Oklahoma, and Millan Hupp, who was a financial and political consultant for Mr. Pruitt’s political action committees in Oklahoma. The E.P.A. has acknowledged that it asked for Ms. Greenwalt’s salary to be raised from $107,435 to $164,200, and for Ms. Hupp’s to be raised from $86,460 to $114,590, under the Safe Drinking Water Act. In an interview on April 4 with Fox News, Mr. Pruitt denied responsibility for the raises. “I found out this yesterday and I corrected the action, and we are in the process of finding out how it took place and correcting it,” he said. Mr. Pruitt is not the first E.P.A. administrator to hire under the drinking water law. Agencies are allowed to fill up to 30 administratively determined positions and that authority has been used by both President Barack Obama and the elder President George Bush. Critics, however, said it was unusual to use the authority to hire deputy assistant administrators as Mr. Pruitt has. Also on Monday, the inspector general for the Department of Interior reviewed costs associated with charter flights that Secretary Ryan Zinke took and found no violation of laws. But investigators concluded that a $12,377 charter flight the secretary took in June to his home state of Montana from Las Vegas, where he was speaking to a hockey team, might have been avoided if agency employees had worked with the hockey team to better accommodate the secretary’s schedule. Nonetheless, Mr. Zinke “generally followed relevant law, policy, rules and regulations” when he chartered the flight, auditors said. The Kochs were not big fans of Trump in 2016, and Trump was not a big fan of the Kochs. But as he staffed up his cabinet, Trump was looking for pliable politicians, [and money for 2020], and Koch politicians are defintionally pliable, and now have job insurance in the Trump administration. However, Trump has angered the Kochs with tariffs and threats of more tariffs, as well as his immigrant/immigration policies. Republican donor Charles Koch slammed President Trump's announced tariffs on steel and aluminum and encouraged corporate leaders to reject the plan in an op-ed on Wednesday. Senate Majority Leader Mitch McConnell (R-Ky.) said on Tuesday he has "genuine concern" the tariffs could lead to a trade war. Under Article. II. Section. 1 of the US Constitution, The executive Power shall be vested in a President of the United States of America. Before he enter on the Execution of his Office, he shall take the following Oath or Affirmation:--"I do solemnly swear (or affirm) that I will faithfully execute the Office of President of the United States, and will to the best of my Ability, preserve, protect and defend the Constitution of the United States." The Koch are biding their time and taking names and making choices. This is which Nichols' Hoursemen of the Trumpocolyse is so important to keep score. Nikki Haley wants to be Secretary of State. But Pompeo, according to Nichols, he is "the Man from Koch." But the Koch are real businessmen and they will not raise a finger to save Trump. And Trump needs/wants Kochtopus money to run in 2020. He has create more havoc for Israel than letting things stands as they were at a Two-State promise. Sheldon and the American Zionists are not pleased. So Trump must shop in the open market controlled by the Kochs. Nikki is a Koch Choice to rule. Notice how the doctor is getting dished by DJT. He can throw the doctor under the bus because he does not belong to the Koch Network. Nikki, bless her little heart may run for president some day.